After Jim Hall pulled his team out of the sport at the end of 1983 Pennzoil moved its sponsorship from Hall's team to Penske while Johnny Rutherford joined Pat Patrick's team beside Gordon Johnocck. Another important change in CART's 1983 lineup was Al Unser's move to Penske, replacing the disappointing Kevin Cogan after three largely unproductive years with Bobby Hillin's Longhorn team. There was also a critical change in the rules for 1983. Sliding skirts had been banned in 1982 but rubber skirts were still permitted. For 1983 however, rubber skirts were also banned and all parts of the bodywork, save the nose, had to be 'rigidly attached' and could be no lower than one inch above the chassis baseline. This reduced the amount of downforce that was being generated and slowed the cars down a little in the corners, but inevitably some teams employed creative methods to induce the sidepods to be sucked closer to the ground at speed and regain some of the lost downforce. Geoff Ferris designed a new Penske for 1983, called the PC11. The new car was based on the successful PC10 and looked very similar, but to the chagrin of Mears, Al Unser and Roger Penske the new car didn't respond to the latest skirt rules. "In '82, we could run the rubber skirts down below the chassis bottom and grind them off," Mears explains. "But they raised the skirt to an inch above the chassis and that's when we realized that mechanically the settings we had were not that good. The PC10 was so good aerodynamically that it masked the mechanical problems. We could run whatever toes, whatever springs, anything, and the PC10 worked. But when we first took the skirts off the ground with the PC11 it was evil. We eventually got it working pretty well, but it took a lot of work to get it sorted." There was also plenty of fresh competition. English car builder March had entered Indy car racing in 1980 and its cars were increasingly competitive in 1981 and '82. 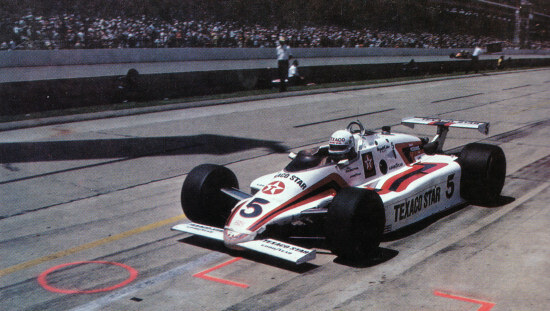 Driving for George Bignotti's Bignotti-Cotter team, Tom Sneva won two races for March in 1981 and two more in '82. 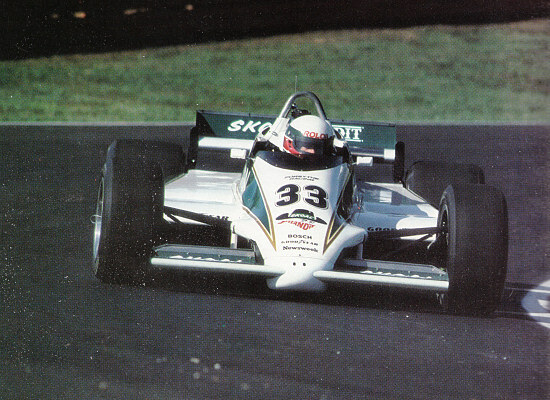 CART rookie Bobby Rahal also won a couple of races in 1982 driving a March for Jim Trueman's new Truesports team. Bignotti-Cotter and Truesports continued with Marches in 1983 and among the car builder's many customers was a new, factory-supported team called Forsythe Racing. Owned by brothers Jerry, John and Jim Forsythe the team raced for the first time in 1982 and was run by Barry Green, an experienced Australian crew chief. Like Rahal and the Truesports team, Green and many of his mechanics had joined CART from the SCCA's failing Can-Am series. March founder and chief designer Robin Herd suggested to Forsythe that he hire a young Italian named Teo Fabi who had made a name for himself in Formula 2 in Europe and the Can-Am series in America. Herd was a fan of the little Italian and with Fabi in the cockpit, Herd agreed that March would provide technical and development support to the Forsythe team. Also new to CART in 1983 was Newman/Haas Racing, a partnership between veteran Can-Am team owner Carl Haas and actor/racer Paul Newman. 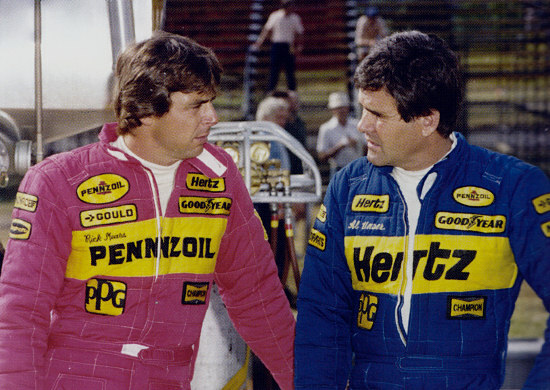 Haas and Newman had run competing Can-Am teams, but Haas was able to convince Newman to join him in a new CART team as long as Mario Andretti would drive the cars. Andretti was out of Formula 1 by this time and looking for a new challenge and Haas was able to sell Mario on the idea of a one-car team focused entirely on him. Chicago-based Haas was also the American distributor for Lola race cars. Lola had built successful cars of all types--F1, Indy cars, Can-Am cars, F5000 cars, sports cars, etc--and a new Lola T700 Indy car was designed and built for the 1983 season. A new Wildcat was also designed and built by Patrick Racing for 1983 for Gordon Johncock and Johnny Rutherford to drive. And there was a new Eagle-Cosworth run by Rick Galles's new team with 20 year old rookie Al Unser Jr. at the wheel. Mears put his PC11 on the pole for the season-opener at his favorite track, the high-banked Atlanta superspeedway, ahead of Rutherford, Johncock, Sneva and new teammate Unser. He led most of the race's first half, dueling with Johncock, Rutherford and Sneva, but lost six laps in the pits changing a broken ignition sparkbox. Neither Rutherford nor Sneva finished and Johncock won from Unser with Mears making it home a distant eighth. The month of May at Indianapolis was next and Mears qualified third behind the Marches driven by Fabi and Mike Mosley with Sneva and Rahal's Marches on the second row and Unser qualifying his PC11 on the third row. It was tough enough for Mears and Unser to match the Marches on pure speed at Indianapolis but the race proved even more difficult as the PC11s struggled with serious changes in balance as their fuel loads were burned off. Front row starters Fabi and Mosley were early DNFs and were joined just after half-distance by Rahal. Neither the Wildcats nor Andretti's new Lola were competitive at Indianapolis and in the end Sneva won going away. Thanks to clean, quick pitstops the Penskes hung in there and finished second and third with Unser eleven seconds behind Sneva and Mears another ten seconds back. A similar story emerged at the next race on the Milwaukee Mile. Fabi again took the pole while Mears was able to qualify second after trying a variety of different rear wings. Fabi led the opening laps but was overwhelmed in the race by more experienced oval racers Sneva, Mears and Unser. Mears lost time in the middle of the race with a cut tire, but in the end he couldn't match the pace set by Sneva and Unser who led for a while. But with seven laps to go Sneva passed Unser and won the race by just over a second. Mears was another nine seconds behind in third place while Fabi finished a lap down in fourth. In the post-race technical inspection there was a giant rhubarb when Sneva's sidepods were found to be too low. Conversation became heated during the inspection and at one point Roger Penske uncharacteristically crawled underneath Sneva's car to check out the measurement and the way the sidepods were attached to the chassis. An hour later, Sneva was disqualified by CART and Unser was declared the winner. 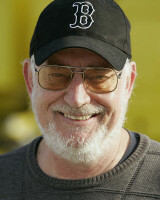 But Sneva's team owner George Bignotti protested the decision. The race eventually was credited to Sneva after an appeal committee agreed with Bignotti's contention that his car's low sidepod was the result of a TV cameraman sitting on the car during the victory celebrations. Many people hooted derisively at the decision but CART's technical officials began to figure out what was going on and how to control the problem. A new rule was written for 1984 which required a fifty pound weight to be hung from a corner of the sidepod to measure the amount of deflection. If it deflected too much, the car was illegal. "If I could lower my skirts by an eighth of an inch, it was a night and day difference," Mears comments. "If the March was getting any advantage out of that at all, it was big. I remember watching Fabi qualify at Indianapolis and he didn't use any racetrack at all. There was another five mph left in using all the racetrack, and after Milwaukee we learned that some people were running sidepods that would deflect under load at speed." But there was more to the problems with the PC11 than other teams beating the rulebook. As the year wore on, most of the March teams and Andretti in Newman/Haas's Lola were able to find more speed while the PC11s went downhill. At the Michigan 500 in mid-summer Mears and Unser were out-qualified by half a dozen Marches although both of them hung on in the race. Helped again by good pitwork and also aided by bad luck for Sneva, Rahal and Fabi, the Penske pair were in the hunt in the closing stages. Mears and Unser ran one-two in the final laps but they were caught by an impressive John Paul Jr. in VDS Racing's Penske PC10. The previous year's car proved better than the PC11s as Paul Jr. passed Unser and was challenging Mears for the lead as they went into the last lap. In turn three, Mears had to lift to avoid running into Chris Kniefel's lapped car allowing the talented Paul to get a run on him and pass on the inside. Mears tried to repass Paul in turn four only to loose control and hit the wall before collecting Kneifel's car. Mercifully, both Mears and Kneifel escaped from the awful-looking wreckage without injury and Mears was classified a lap down in fourth place behind teammate Unser and Andretti's improving Newman/Haas Lola. After Michigan the Penske team decided to build new versions of the previous year's car and put the troublesome PC11s aside. The new cars were called PC10Bs and had different suspension geometry than the 11. Mears raced his for the first time in August's Pocono 500 where he finished third behind winner Fabi and Al Unser Jr. who switched from an Eagle to a March for that race. Unser's PC10B arrived a few races later and Rick and Unser finished the season with the cars. Mears's only win of 1983 came in the 200-mile race at the Michigan superspeedway in the fall. He struggled in practice and after qualifying eleventh Mears's crew worked half the night to reconfigure their car with new underwing tunnels and exhaust headers for race day. Mears was able to come through the field to take the lead after forty laps and go on to win comfortably from the Marches of Rahal and Fabi. But he was entirely out of luck in the year's last three races. In Las Vegas, he finished the race in a sorry state, lacking any brakes, stuck in third gear, and without a rear wing after he was hit in the tail on a late restart! That was better at least than the final two races at Laguna Seca and Phoenix were he dropped out of both races in the early laps with more gearbox trouble. In contrast to the previous year, Mears failed to finish five of the year's thirteen races and completed the season sixth in points. Meanwhile, teammate Unser eked-out the championship with a late-season string of fourths and fifths. Unser's only win of the year came at the Cleveland airport race in July, but he was able to beat Fabi to the championship by five points. Unser won the title on reliability, completing more laps than anyone else, particularly his closest rivals Fabi, Andretti, Sneva and Rahal, none of whom were within 200 laps of Unser's total tally of laps completed for the season. Rookie Fabi did all he could by taking pole and winning both of the year's final two races, but he fell five points short of catching the resolute Unser. Mario Andretti was a resurgent third in points behind Fabi after taking a win and pair of seconds in the last three races of the season as Newman/Haas sorted-out its Lola T700. 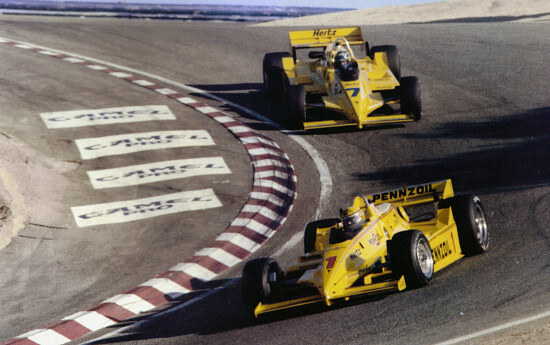 Sneva and Rahal took fourth and fifth in the championship, just four and two points respectively ahead of Mears. Even less fortunate than Mears in 1983 were Johnny Rutherford and Gordon Johncock both of whom missed most of the season after they broke legs in separate accidents. The Patrick team's new Wildcats proved even more problematical than Penske's PC11 and as a result Rutherford crashed twice during practice at Indianapolis, breaking his left foot and then his right ankle. After switching to a March, Johncock crashed two months later in the Michigan 500, breaking both ankles and his right leg. Although they continued to race Indy cars through the rest of the decade, these accidents were the beginning of the end of the careers of two of the sport's greatest drivers from the seventies and eighties.